The slightest event, or even ‘non-event’, at Newcastle United is always amplified by 100. This past week it was something as simple as a free transfer signing and the official announcement of the new kit. On the face of it, Newcastle made a good signing that took a lot of people by surprise. Mainly because nobody knew anything about it until around an hour or two before it was officially announced. A pleasant surprise for once. After reading an article on The Mag, as well as a few comments on twitter regarding the comparisons between this kit launch and those of previous years, it got me thinking. Then, the club’s Head of Marketing Communications commented on the feed, suggesting the whole thing (the commenting on the kit launch) was ludicrous. Quite entitled to his opinion, although I though his tone was rather inappropriate given his position of responsibility. In the middle of writing a University thesis at the moment, it was going to take a lot for me to break off and write something…but the more I thought about it, the more it got me thinking about the larger utter contempt that the club has for its fans. Before writing something that would largely be viewed as a ‘moan’, I spent the whole weekend trying to think of all the good things about the club at the moment. 4. Our loyalty points system is pretty good and probably the fairest way to go about things. What this summer has proved to me more than any other summer is that the club has drifted into a second-rate, knock off version of a football club. You might say, where have you been for the past 10 years, and that’s a fair comment, but it has really hit home this summer. Look at us, wheeling and dealing, scraping the barrel of the transfer market for loan signings, free transfers and looking to sell some of our best players. What nags me also is that the press seems to be going along with it. I don’t see any other clubs in the bottom half of the PL wheeling and dealing like Newcastle seem to be doing. There will be some people of course who will say “well other clubs haven’t done much either” or “we are only half way through the summer and the World Cup hasn’t finished yet” but this isn’t new, other clubs haven’t been doing what Newcastle United have been doing for the past 10 years. I guess deep down I had a feeling this summer might be a little different, especially giving the positive end to the last season. Now, that feeling deep down is that this isn’t a football club anymore, anyone who thinks otherwise I think I would argue all day with you. I used to disagree with what I am about to say but it is very clear now: first and foremost, Newcastle United is a marketing tool for Sports Direct, and a football club second. The primary aim of Newcastle United is to promote the best interests of Sports Direct, not to win football matches, not win trophies. It is the only logical explanation as to why Sports Direct don’t pay advertising fees and why there is not more transparency on the relationship between SD and the NUFC online and offline shops. The central point I am trying to make in this article is that Newcastle United remains an incredibly mismanaged football club, and attention has drifted away from this fact, just because Rafa got the team playing well. Would it be too much to have hoped for a summer filled with a little bit of hope, a bit of expectation, mixed with excitement. Supporting Newcastle United is none of that. Not any more anyway. It used to be like that, it used to be excitement of who we were going to sign, how would we improve on last season, which young players may get a chance the next season. Now what do we have? A clutch of free and low fee signings, talk of selling our most promising young player (Merino), and one of our best players (Ritchie). For the record, I think Ki is a very astute signing, I watched him at Celtic for a few years and was surprised that only Swansea (no disrespect intended by that) picked him up at the time. However, in the wider context, I see this signing as a symptom of what this summer is going to look like. Looking for a bargain. It seems like a continuation of the policy we have seen at Newcastle for 10 years (which hasn’t worked), of looking at the bottom of the bargain basement for a plucky signing. In fact, I don’t see any evidence that the whole ‘purple’ players philosophy has changed. What really annoys me the most is that the club make a free signing for an average PL player (albeit a good signing) and there is this expectation that the fans should be jumping for joy. Is that what it has come to? I have to be honest, I would question whether this was even Rafa’s signing. 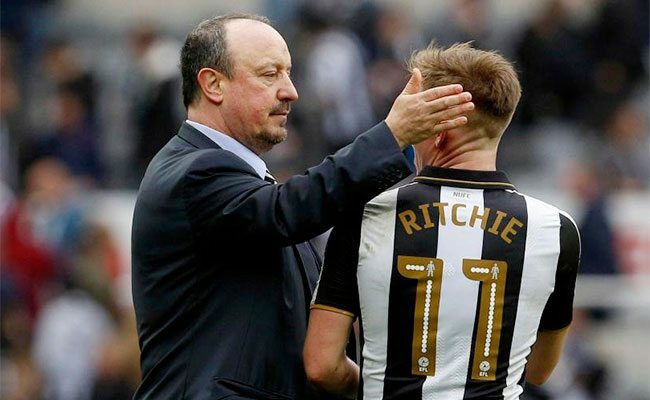 I would actually argue that if the reported rumours of swapping Townsend for Ritchie are true, then I would question just how much control Rafa has over signings. I find it hard to believe that he would want to swap Ritchie, a player that epitomises playing for NUFC under Rafa, for a player that didn’t even want to play for us… irrespective of how much Rafa reportedly likes Townsend. Even the Ki signing, I do feel bad for even thinking it, and it is probably disrespectful towards a good player like Ki to suggest it, but it wouldn’t half surprise me if this wasn’t Rafa’s idea at all, instead it was an opportunity for Sports Direct to sign a big player from the lucrative Asian market. I don’t necessarily believe that…but it is a guilty thought that I have had. Funny enough, I have said something similar on social media and there are a few comments from people who say “how can you say this only halfway through the summer” etc, to which I can only ask the question “where have you been for the last 10 years?”. If anything, this summer is going to be even worse. Right now, Newcastle have around 28 senior players on their books, so Rafa is only going to be allowed to sell before he can buy… there are even reports that Fulham aren’t willing to pay the 20 mil for Mitro. Even the absolute certainties like the Mbemba and Sels deals have fallen through. It is so mismanaged it’s beyond belief. Again, people will say “ah you are having a moan – typical moaning about anything”. The truth is that we have been moaning about the same thing for at least 10 years now. It is actually the reason why I really like The Mag… because even through the times when the results are good or bad, people on this website still highlight the good and the bad. This brings me to my next point, that it appears people at the club, as well as the local press, like to hide the failures at the club while the results on the pitch are ok. Criticism levelled at the club during the ‘good times’ (god forbid that one decent season finishing 10th is the good times) is seen as fans moaning and being unrealistic when in actual fact, a lot of the criticisms about the club are unrelated to results on the pitch. Likewise, I feel that the press has avoided any criticism of the club during Rafa’s stint because they like Rafa, and they like the access the club gives them when being ‘friendly’. I may be wrong, probably am wrong, but that’s how I see it. In fact, I would argue that the worst thing about Rafa being in charge, is the fact he gets decent results out of a lot of average players which allows the club to continue its shambolic policies and largely be unaccountable for it. What this really comes down to, is how a football club is run. I come from a family who also support Celtic, so I have always been brought up on the idea that a football club belongs to the fans, the community, it should be run in the interest of the people. Essentially a football club belongs to the fans, and is for the fans. Jock Stein once said “Football without fans is nothing”. Some people see The Mag as being too negative. I don’t really see it that way. For me, The Mag is a space for ANY Newcastle fan (ED: See details below) to be able to give their opinion on their club. Anyone can write for The Mag, all you have to do is write your opinion and email it over, so I think this idea that The Mag has some sort of agenda that writers have to conform to is a complete myth. It is actually just the opinion of some fans. Previously, I went with the idea that we should get behind Rafa because he is the best thing to happen to Newcastle for a while, but I am slowly learning that as long as the structure and other personnel at the club is the same, then nothing would ever change. It may be that Rafa leaving would be the best thing to happen to Newcastle, if it meant that it would anger fans so much that they made a greater effort to get rid of Mike Ashley. 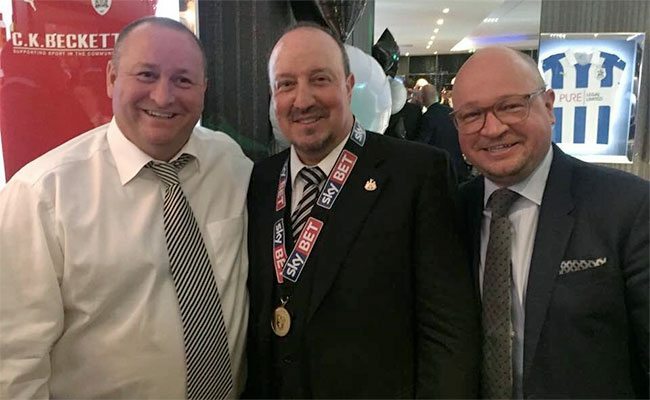 I would rather be in League Two without Rafa Benitez and Mike Ashley, supporting a club with a bit of identity, than be in the Premier League right now with Mike Ashley (though of course I don’t really want to lose Rafa, unless it was the only way to get rid of Ashley). Maybe I am a mug for renewing my season ticket, but hell, I want to watch my football team… and on the off-chance that we do miraculously make it to a cup final, I want to be there, and I am not going to let that fat b…… stop me. One thing is for certain though, as long as those Sports Direct signs surround the stadium, and as long as those signs either side of ‘Newcastle United’ hover above the hallowed turf, this club has no identity and it will never truly be our club.